Astoria, Part of Long Island City, Town of Newtown, Queens, Co. L.I. A scarce example of Fredrick W. Beers' map of the southern part of Astoria, Queens, New York. Published in 1873, this magnificent map covers from Hells Gate and Halletts Cove eastward as far as Third Ave and the 'Lorrenz and Wiegand's Hot Houses.' Street names have long since changed, but by today's reckoning this map covers, roughly, from 1st street eastward as far as 34th or 35th street and from 24th road and Hoyt Avenue southward as far as Broadway. Details the homes of individual land owners and families. Verso contains maps of Newtown, Woodside, Maspeth and East Williamsburgh. 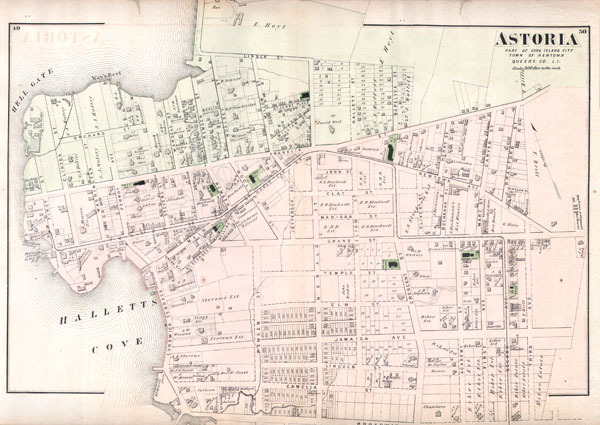 This is probably the finest atlas map of Astoria to appear in the 19th century. Prepared by Beers, Comstock & Cline out of their office at 36 Vesey Street, New York City, for inclusion as plate no. 50 in the first published atlas of Long Island, the 1873 issue of Atlas of Long Island, New York. Very good condition. Original centerfold. Minor transference. Map runs off edge of page, as issued. New York Public Library, Map Division, 1527281.